Hartford Courant, Sunday June 8, 2003, page. C4. Architecture hasn’t changed that much. The Roman architect Vitruvius defined this most complex of disciplines as the union of “firmness, commodity and delight.” Using more familiar language, architecture strives to produce buildings and spaces that are structurally sound, useful and beautiful. This trinity of criteria also applies to the Connecticut River lowland, the loaf-shaped valley embedded in the heart of our state. In Connecticut’s case, the first building material brought to the site was little more than sandy mud, caught up in a three-way tectonic collision between North America, Europe and Africa. In the process, the mud was forced deep within the Earth’s crust, perhaps to a depth of fifteen miles, well beneath a mountain range of Himalayan proportions. There, the mud baked slowly under such high temperatures and such enormous pressures that the originally soft raw material metamorphosed into a crystalline solid, completely devoid of spaces. It is this pressure-baked material that comprises the bulk of the tenacious, light-colored rocks of the eastern and western highlands, where colossal fieldstones abound. Granite, gneiss, schist and quartzite are their names. In contrast, the brown and barn-red rocks of the Connecticut River lowland were formed when the weather-beaten residues of these originally tough rocks washed together as layers of gravel, sand and mud that were later pressed tightly together, then even later cemented by rust, which accounts for their earthy hues. These are the familiar tilted layers of brownstone that peek out at us from roadcuts and excavations throughout the central valley, and which are proudly exhibited in landmark buildings all over the Northeast (for example, Hartford’s Asylum Hill Congregational Church). The most famous “brownstone” of all, however, is a bedrock slab in Rocky Hill that — in a successful architectural juxtaposition of material and form — is carefully protected beneath an aluminum geodesic dome at Dinosaur State Park. There, the mica-laden mud contains dinosaur footprints called Eubrontes, Connecticut’s state fossil. The gathering point for these residues was a rift valley not unlike those of east Africa today, a generally dry place with turquoise-colored lakes, sandy rivers, marshy shores, rumbling earthquakes, steaming volcanoes and the shrieks and squawks of early dinosaurs. All of this took place some two hundred million years ago, when the Eubrontes track-maker, Dilophosaurus, a large, three- toed flesh-eating creature that walked on its hind legs, would have been free to stalk its prey not only across Rhode Island, but also straight into what is now southern Morocco. The Atlantic Ocean didn’t yet exist. In its place was a tired mountain range already being thinned and stretched as the earth’s plates, having reversed their direction, were beginning to tear the land apart. One of the early breaks is now an escarpment, extending from Enfield to Haddam. There, the hard rocks ruptured along a fault, yielding a giant block that sank downward into the earth’s mantle. The block on which Hartford now sits dropped downward like the keystone of an arch whose sides were being pulled apart. Then something critical happened. A new break formed to the east, between what are now Rhode Island and Morocco. There, the fault was deep enough to start a new ocean, which began as a narrow sea, then widened as it aged (like many of us). Meanwhile, the gathered layers of river and lake sediments from New Haven to Holyoke — some infused with dinosaur footprints and the remains of ancient trees — had sunk deep enough into the moist warm earth to become compacted and cemented into relatively weak, crumpled layers of red-brown rocks. Since their formation, these softer rocks of the state’s heartland have been less able to withstand the wear and tear of time (the exposure to the sun, wind and rain) than the harder rocks on either side of the valley. That same differential weakness was evident when the glacier slid south over New England, gouging, scraping, and rasping the lowland into an elongated basin. What had once been the highest part of New England had became its largest lowland, one big enough to capture runoff from Long Island to Quebec, and channel it past Hartford, where it flows strong and brown every year, especially during March, when northern snowmelt and warm spring rains coincide. 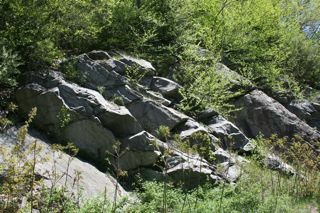 The only high places in the lowland – – trap rock ridges such as Talcott and Avon mountains — are the hard places, which are composed of cooled lava, rather than sandstone and shale. The Connecticut River lowland meets all the criteria for architecture. It is structurally solid, having long since recovered from its earlier episode of rifting. It is useful, so much so that early 17th century scouts from Plymouth Plantation deemed it an agricultural Eden; three centuries later, the cities and transportation networks in the valley still testify to its utility. Finally, there is the beauty. Although blemished with urban blight and often undetected from the vantage point of an automobile, the enchantment of the valley can be seen from any long vista across it. At that scale, what passes for human architecture — for better and for worse — is subsumed by the work of earth’s original architect, who worked long before the days of ancient Rome. Granite from Branford. Brownstone from Portland. Marble from Kent. Traprock from lava ridges. Fieldstone from nearly everywhere. All of these stones have been plucked from their initial geological settings, brought to the heart of the state, and recycled by human architects into the beautiful buildings, monuments, walls and pathways of our everyday lives. We live among ruins of an earlier age.